New interim president, new dining hall, new students. 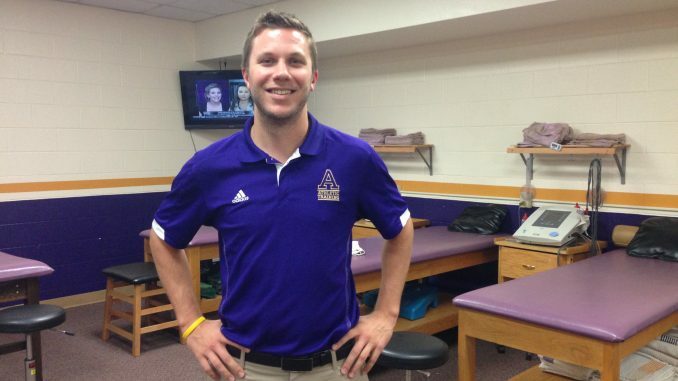 To add to the list of “new” this year, we welcome Andy Lawrence, the new head athletic trainer here at Albion. Lawrence joined the Albion staff this summer after working as the head athletic trainer at Trine University for three years. Before his time at Trine he worked with sports teams at Michigan State University while obtaining his bachelors degree, and after at Portage Northern High School while attending grad school at Western Michigan University. He also worked a season-long internship with the Detroit Lions in 2007. This year he is excited about joining the Brits, hoping to bring more positive energy and efficiency to the athletic program here. Lawrence also hopes to encourage a new sense of school pride within the student athletes. For example, students are encouraged to show their Briton pride through the shirts they wear to the training room. In other words, don’t show up to the training room in an MSU or U of M T-shirt. As a Michigan State grad, Lawrence calls himself a die-hard MSU fan. While at Albion, however, he wears his purple and gold with pride and encourages student athletes to do the same. So far Lawrence’s time at Albion has been great. He is impressed by the students’ respectful attitude and will to work hard as well as the friendly coaches and staff. “There is such a positive momentum within the athletic department,” said Lawrence. With the first the first fall sports games and competitions just beginning, Lawrence is excited to see what students will accomplish this year.